Does working memory training have to be adaptive? This study tested the common assumption that, to be most effective, working memory (WM) training should be adaptive (i.e., task difficulty is adjusted to individual performance). Indirect evidence for this assumption stems from studies comparing adaptive training to a condition in which tasks are practiced on the easiest level of difficulty only [cf. Klingberg (Trends Cogn Sci 14:317–324, 2010)], thereby, however, confounding adaptivity and exposure to varying task difficulty. For a more direct test of this hypothesis, we randomly assigned 130 young adults to one of the three WM training procedures (adaptive, randomized, or self-selected change in training task difficulty) or to an active control group. Despite large performance increases in the trained WM tasks, we observed neither transfer to untrained structurally dissimilar WM tasks nor far transfer to reasoning. 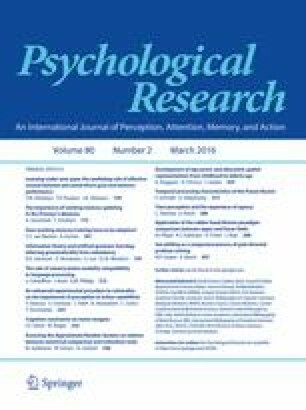 Surprisingly, neither training nor transfer effects were modulated by training procedure, indicating that exposure to varying levels of task difficulty is sufficient for inducing training gains. This work was supported by a grant to the first author from the Suzanne and Hans Biäsch Foundation for Applied Psychology. We thank Borhan Bas, Linda Horvath, Lukas Lehmann, Cristina Licini, and Rahel Rodenkirch for their assistance with collecting the data. We also thank Esther Haeller, Esther Spirig, and Anja Waldmeier for their help in creating study materials. Bates, D. M. (2010). lme4: mixed-effects modeling with R. Retrieved from http://lme4.r-forge.r-project.org/book/. Deci, E. L., & Ryan, R. M. (2015). Intrinsic Motivation Inventory. http://selfdeterminationtheory.org/questionnaires/10-questionnaires/50. Retrieved 13 June 2013. R Core Team. (2014). R: a language and environment for statistical computing. Vienna, Austria: R Foundation for Statistical Computing. Retrieved from http://www.R-project.org/.